This may seem like a bit of a dereliction of my Thursday duties. But, under the circumstances I thought I'd bring back a real classic published in Science back when big hair and Genesis were de rigueur. This one is about the shot that nobody in the world heard because it happened 65 million years ago. Then-retired UC Berkeley geologist Luis W. Alvarez, his son Walter, Frank Asaro and Helen Michel conspired in what became a paradigm-shifting, figurative tsunami in the geological literature (and in the zeitgeist of every geologist from here to...well, probably...Timbuktu!). 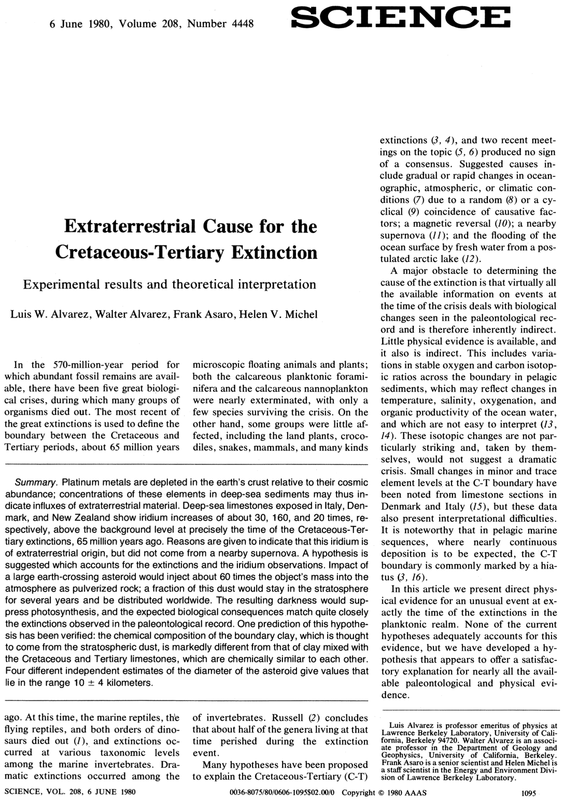 'Extraterrestrial Cause for the Cretaceous-Tertiary Extinction' and the deluge of scholarly papers that it spawned are the direct ancestors of the Younger Dryas Boundary impact hypothesis, about which you've seen much at the Subversive Archaeologist in the past week. [Back in 1980 I was a library clerk at Agriculture Canada's Vancouver Research Station, still several years away from beginning an undergraduate degree in Archaeology. In those days I still had visions of standing hip to hip with Don Johanson or Richard Leakey while they solved the riddle of the human past. One of the many nationally important jobs I performed was opening the mail. Then I set the incoming journals on the shelf. I fetched. I carried. Anyone with a wry sense of humour will, at this point, note that my career vector is pretty close to uppercase sigma from x=1 to infinity of 1/x. But, as I keep assuring you. I ain't bitter. With that lovely recollection hanging out there, it's probably going to seem unsympathetic of me to continue with extraterrestrial impacts. But, then again, both AIDS and whatever caused the extinction of the dinosaurs were responsible for the deaths of many millions. Here's hoping we have more luck with AIDS than the dinosaurs had with visitors from outer space. In 1980 was immediately drawn to Alvarez et al. 's hypothesis. It has always seemed to me that something very, very bad and at the same time something very big must have been responsible for the second greatest 'dying' in the Earth's history. Speading sea floors and disease just didn't do it for me, and the contemporaneous theory that a supernova had destroyed most life on Earth seemed just a little hard to swallow. But the extraterrestrial impact seemed appropriately big and sufficiently bad to satisfy my criteria in the matter, especially if you consider that it the nuclear winter scenario had only just been floated by the anti-nuke movement of the time. So, with my new-found extinction theory in hand, I started talking to people. You'd be surprised how much resistance there was to the notion. I still think it's weird. I'm wondering if it isn't a species of cognitive dissonance, whereby the mind actively tries to downplay an unpleasant idea--e.g. that the earth has been, and will continue to be, bombarded by rocks from outer space forEVER, and that there's nothing to be done except to accept it as a given and try not to get too stressed about it. So, what heresy did Alvarez et al. proclaim over thirty years ago that was so actively resisted in the scientific community. Oddly, I think it wasn't the fact of the impact hypothesis itself that rankled, but rather the proposal that life on Earth was utterly changed as a result. Again, it may have been cognitive dissonance at work. To this day there are many who downplay the role of the asteroid in killing of about 40% of life on Earth, and claim that the extinctions weren't as much of a punctuation mark as Alvarez and others were suggesting. It's strange to read this article again after so many years. It's as if the authors were discussing doing the dishes. No spectacle. No hyperbole. Just matter-of-fact and immediately accessible words--even to the non scientist. Listen to what they say about the effect of the asteroid. In brief, our hypothesis suggests that an asteroid struck the earth, formed an impact crater, and some of the dust-sized material ejected from the crater reached the stratosphere and was spread around the globe. This dust effectively prevented sunlight from reaching the surface for a period of several years, until the dust settled to earth (1105). That's that! Oh, there were pages on the evidence, most of which Marco Langbroek outlined in his post on Tuesday--enhanced iridium at the Cretaceous-Tertiary boundary, shocked quartz all over the place, brecciated sediments. Then there was the extinctions. People had been debating for decades what might have happened. 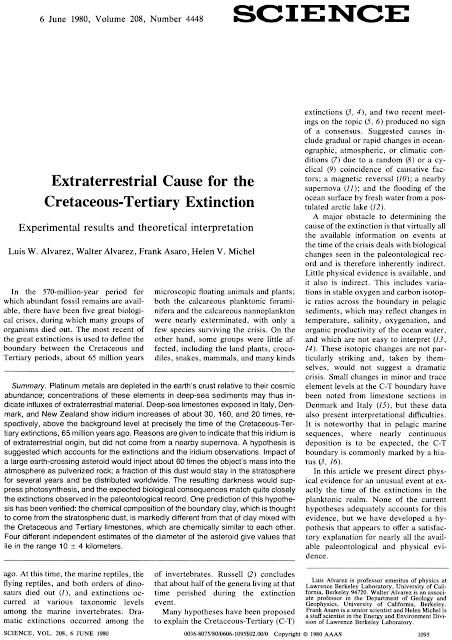 And rather like the discovery of plate tectonics, the authors' proposal of an extraterrestrial impact made sense of it all. Loss of sunlight suppressed photosynthesis, and as a result most food chains collapsed and the extinctions resulted (1105). So simple. So logical. So...expectable. I'll leave you with the photo below. It's what gave me the idea to put the Alvarez et al. hypothesis in the Thursday spotlight. 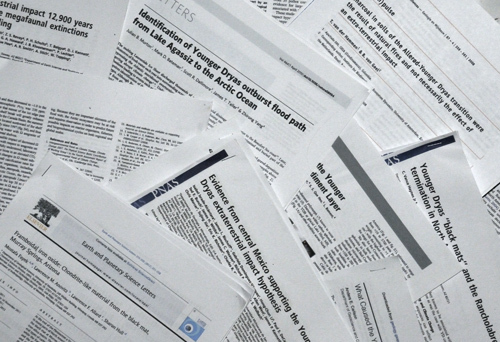 That's because it's a collection of recent papers about the Younger Dryas impact hypothesis, and like the Alvarez et al. paper, it'll be ten times bigger before all is said and done. Having had a little more time to stew about it, and to nose around in the literature, I'm not sure the impact hypothesis won't stand up when all the data are in. Perhaps it won't stand on some of the 'novel' evidence that's been proposed; perhaps it will. But I think it's a very good place to start if we're serious about explaining the widespread occurrence of Vance Haynes's 'black mats' at 12.9 ka. Just a smattering of the paper and ink already spilled on the Younger Dryas Boundary impact hypothesis. Seeing it inspired me to recall the progenitor of all such theories--Alvarez et al. 1980 (Credit skepticalscience, which also has a darned good summary of the research to date: click here to see it). I'll be lifting off for now. Keep your eyes on the sky! * It's Thursday somewhere already. Publishing this now means that I can take a breather tomorrow [er...yesterday?]! wonderful article... might help us a good deal,it is Exactly what I was trying to find! Many thanks.